This week I looked at handwritten minutes for the period Feb. 23rd. to Dec. 1955 when the President was Miss Elizabeth Hughes whose sister Eva also used to attend meetings. At that time these were held either in members’ houses or in local hotels, even a pub. Minutes were taken at each meeting, being read, approved and signed at the next. Sometimes there were outside speakers. Ludovic Kennedy came to talk about George Herbert on March 1st. 1955 at an Open Meeting at The Beckenham Hall and a lecturer from Birkbeck College came to give a talk on William Blake. Members often gave what they called ‘papers’ on various meaty topics such as ‘Philosophy In Poetry’ and ‘The Tractarian Movement.’ There was also a liking for choral speaking and members performed ‘Cullin Sands’ by Gordon Bottomley. Numbers at meetngs seldom went below 20 and there were frequent visitors. A link had been forged with a Poetry Circle in Cley, Norfolk and there were yearly visits, one to the other. As we do now, topics for the meetings were decided in advance e.g. Nature’s Tiny Creatures, Time To Stand and Stare,The Glory That Was Greece, Saints and Sinners and the quite tricky, The Music In My Heart I Bore. Mrs Pereira expressed the opinion that she felt that poems on Easter or Christmas, as the case might be were becoming a little stale and that, in future, subjects other than these might be selected by the Committee from the Suggestions Book when they were drawing up the programme. This entry was posted in Shortlands Poetry Circle and tagged Ludovic Kennedy, William Blake on January 29, 2015 by shortlandpoetrycircle. My neighbour, Betty, used to look in my many poetry books for poems for SPC meetings. I had to wait until I had retired from teaching before I could join her. It was a very elderly group then and I was amused at a member coming in with two cushions, one to sit on and one for her back, just like I do now! It wasn’t long before I became Assistant Secretary and soon after that, Secretary when Beth Fender moved to Belper. I enjoyed helping to organize the 80th. and 90th. Anniversary Celebrations, and to see the publication of Perspectives for the 50th anniversary of the Writers’ Group. I stayed on for eleven years as Secretary, too long. One of our members got round the rule of not reading your own poems by getting our actress member to read them for him. Another member, years ago, used to read rather spicy poems and our then President suggested it was not the sort of poetry for our meetings. I recall chanting om . . . . m at his funeral. The first poem I wrote was for my school magazine. Beth Fender asked me to come along to Shortlands Writers’ Group. 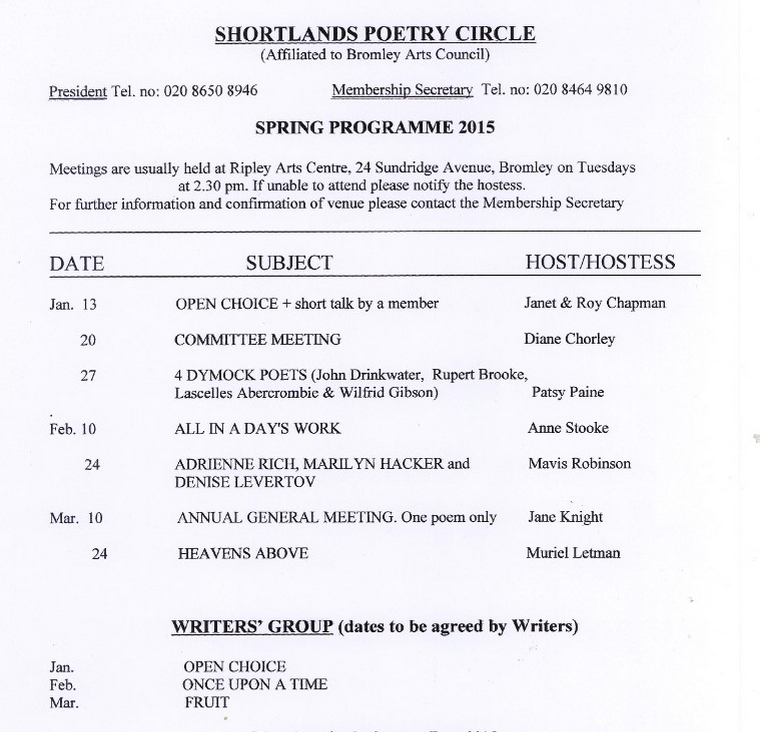 This year, 2015, is twenty-five years since I joined Shortlands Poetry Circle – a happy time. This entry was posted in Member Profiles, Shortlands Poetry Circle and tagged Lesley McLetchie on January 26, 2015 by shortlandpoetrycircle. Our next meeting will consist of readings from the work of four Dymock Poets, John Drinkwater, Rupert Brooke, Lascelles Abercrombie and Wilfrid Gibson. Edward Thomas and Robert Frost were also associated with the group, some of whom lived near the village of Dymock between 1911 and 1914. In 1915 Robert Frost returned to America. The Dymock poets published their own quarterly ‘New Numbers’ and among the poems published was Rupert Brooke’s ‘The Soldier.’ Dymock is between May Hill in Gloucestershire and the Malvern Hills in Worcestershire. This entry was posted in Poetry, Poetry Events, Ripley Arts Centre, Shortlands Poetry Circle and tagged Dymock poets, Edward Thomas, John Drinkwater, Lascelles Abercrombie, Robert Frost, Rupert Brooks, Wilfrid Gibson on January 26, 2015 by shortlandpoetrycircle. Following a short talk by Ruth Smith on The Little Magazines’ the meeting proceeded with members’ choices of one long and one short poem to share with the group. On this occasion there was no theme or particular poet so the range was very wide, from Southey to Les Murray and much in between, both comic and serious. We were very pleased to welcome a visitor to the meeting who not only reads but writes poems and hope to see him again. 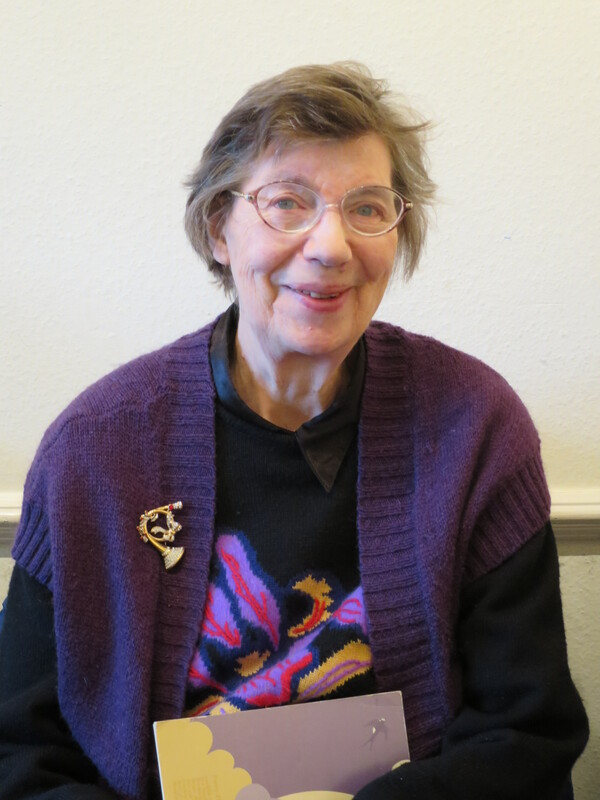 This entry was posted in Poetry, Poetry Events, Shortlands Poetry Circle and tagged ruth smith, The Little Magazines on January 26, 2015 by shortlandpoetrycircle. Congratulations to our own Ruth Smith, who was awarded a ‘Highly Commended’ in the Gregory O’Donoghue International Poetry Competition judged by Matthew Sweeney. 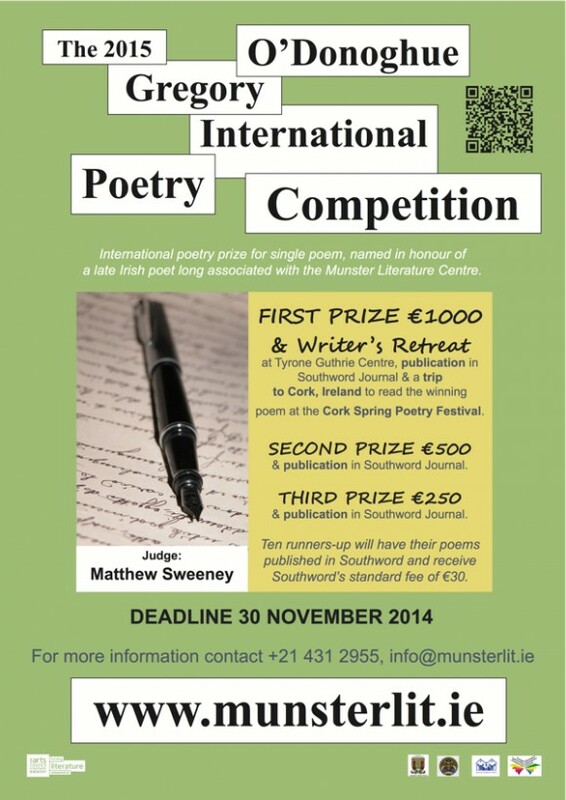 This entry was posted in Shortlands Poetry Circle and tagged gregory odonoghue, mathew sweeny, ruth smith on January 12, 2015 by shortlandpoetrycircle. Readers: Apr 28, May 12 & 26, Jun 9 & 23, Jul 14. Writers: Dates to be agreed by Writers. If you cannot find a poem for the topic/poet listed, please read another poem, but not one written by you N.B. We each read I long poem and 1 short poem (of about sonnet length).